Ukulele tablature for 19 vintage Stones hits including hot licks and solos. 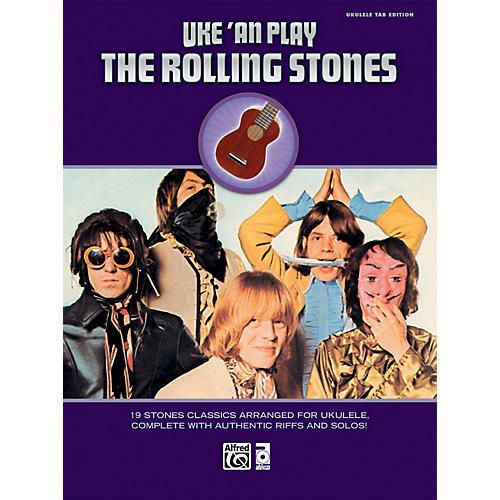 The Uke 'An Play the Rolling Stones tab book features 19 classic Rolling Stones songs arranged for ukulele. It includes all the classic guitar riffs in tablature form for easy learning. The ukulele tab book includes these songs: "19th Nervous Breakdown" • "As Tears Go By" • "Brown Sugar" • "Dandelion" • "Get Off of My Cloud" • "Gimme Shelter" • "Honky Tonk Women" • "It's All Over Now" • "Jumpin' Jack Flash" • "The Last Time" • "Let's Spend the Night Together" • "Mother's Little Helper" • "Paint It, Black" • "Play with Fire" • "Ruby Tuesday" • "Satisfaction" • "She's a Rainbow" • "Under My Thumb" • "You Can't Always Get What You Want"
Take your ukulele in a whole new direction and let it bleed with these classic Rolling Stones tracks. Order now.